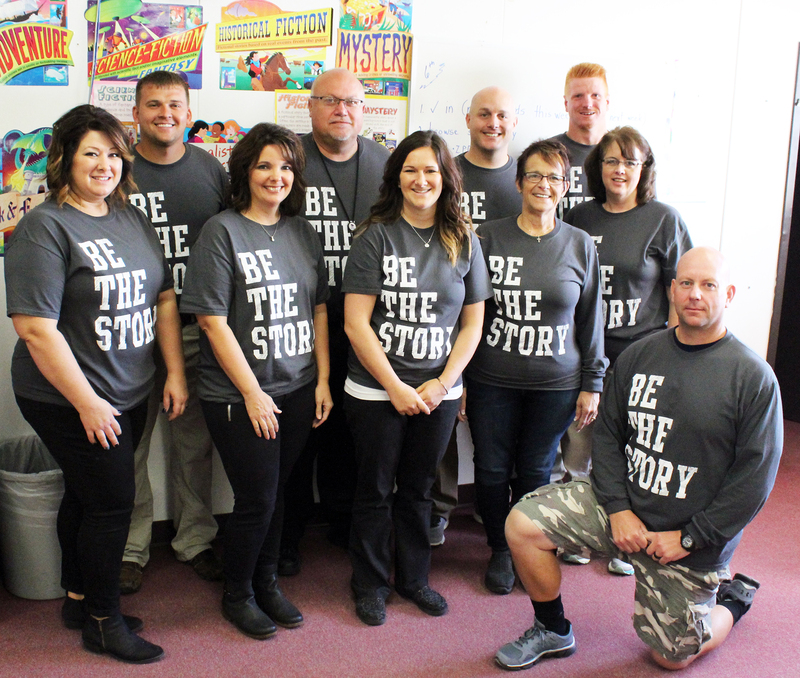 Cultivating Culture: Clarkson aims to "Be the Story" | Nebraska Public School Advantage - The power of public education. Lee Schneider’s made-for-television movie begins here, at sunset deep in the dunes of the Nebraska Sandhills. The second-year principal’s arms are fully extended to reach his motorcycle’s gorilla ape handlebars. His do-rag flutters in the wind as he drifts down a steep hill, picking up more and more speed with each line of “I Need a Hero” Bonnie Tyler belts out in the background. It’s okay, so was Schneider’s Clarkson staff, gathered for their first official meeting of the 2017-18 school year. “At you, not with you,” school counselor Jennifer Kappel quipped with a smile. Chuckling is not only allowed, it’s encouraged. This is an icebreaker, after all, and not before long teachers willingly began carving out plots to their own made-for-TV flick. Share the story. Be the story. Schneider pitched the new motto at that first meeting, and the Clarkson staff has embraced it since. Every good movie has a signature song, he said. Every baseball player has a “walk-up” song that puts them in the mood to rope a base hit. Schneider has all of Clarkson’s teachers’ songs in a spreadsheet. Schneider has been at Clarkson for seven years now. The school is the cornerstone of the community along Highway 91. He left NCSA’s Administrators’ Days in July wanting more transparency. Schneider knows his students do great things. He sees it every day. No reason to be shy about it, he tells them. Be proud and broadcast your accomplishments. 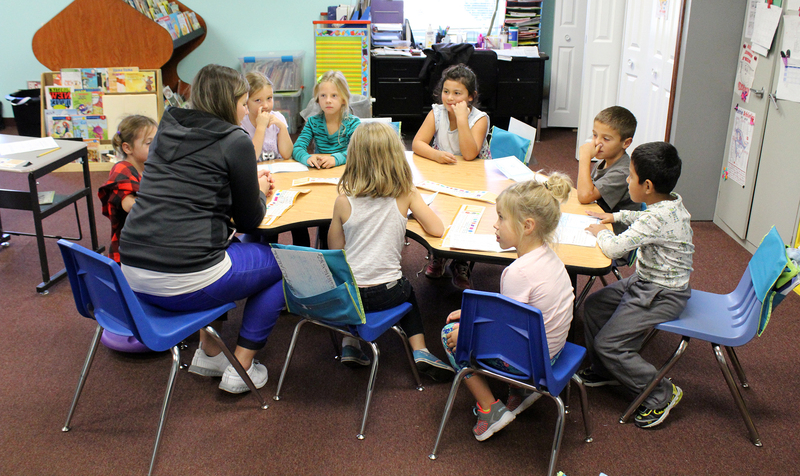 Kappel has a dozen years of experience at Clarkson, where the students have always been “amazing.” What has strengthened through the years are the relationships between staff and students. One thing Schneider respects about Clarkson superintendent Rich Lemburg, who also serves as the K-6 principal, is the way he cultivated a sense of family. If you need anything, Schneider said, just go in and ask. Tami Sayers is in her second year of teaching middle school English at Clarkson and has seven years of experience altogether. She is a graduate of Clarkson, and, during her interview process, felt at home once again. She'd found what she was looking for. Proof sits on the edge of Schneider’s desk in the form of a massive fantasy football trophy, awarded to the winner of a staff-wide league. Clarkson teachers take pride in meeting and developing friendships outside of class. Inevitably, it spills over to the students. During passing periods, the hallways are filled with hooting and hollering, high fives and plenty of laughs and smiles. Some of those high fives are shared between seniors and sixth-graders. Some between juniors and fourth-graders. That’s what’s so cool about facilitating a supportive culture in a small school. With everyone in one building, the support knows no bounds. McEvoy was heading into her sophomore year when the idea of a student mentorship program first popped into her head. She bounced ideas off her father and eventually approached Kappel with the basic description, and together the two came up with a model for what would come to be known as Patriot Pals. A minimum of two times a month, high school students will meet with an elementary kid to have lunch and provide guidance. Sometimes, they’ll sit in on their Patriot Enrichment Program (PEP) session, a 30-minute window that Kappel and staff transformed into a block for teachers (and community members) to pass on life skills that lie beyond curriculum such as woodworking, babysitting (with high-tech simulator dolls borrowed from ESU 7), cake decorating and anemology. PEP is a story of its own, a chance for teachers and even administrators to travel beyond typical coursework and into their hobbies. Lemburg, for example, ran a session on chess. McEvoy said the staff and her fellow students were receptive to the Patriot Pals idea from the start. Though class sizes are small (there are 13 students in McEvoy’s 2019 graduating class), the program has seen tremendous participation. Last year, 17 Patriots volunteered. This year, with the direction of Schneider and business teacher/Clarkson-Leigh girls basketball coach and football assistant coach Matt Murren, Clarkson students formed the “American Outlaws”, the school’s devoted student section at athletic contests. Murren has played a significant role in Clarkson’s push to “Be the Story”. Now in his sixth-year, he oversaw the production of a Clarkson Public School promo video last school year and helps students put on the “Crazy Clarkson Public Schools Newscast”. Murren also helps with the special education program, coordinating the production of some pretty cool music videos that turn high-needs students into on-screen stars. The newscasts are a way for students to voice their opinions, Murren said. Every kid gets a say. As he’s found out, Clarkson students are ready and eager to show and tell what is going on inside the school. Things aren’t always easy in a small school. I visit many, and am usually amazed by the time I leave. Amazed with the character of the kids and by the humbleness of the staff. Instilling culture, embracing challenges and staying positive takes a collaborative effort. Schneider, the principal, even teaches a couple of classes. Clarkson doesn’t seem to shy away from obstacles. If it benefits their kids, the staff would rather plow right through them. Aside from a handful of other duties, Murren will sometimes drive the school bus. Instead of an additional chore to shoulder, he sees it as an opportunity. After the visit, I walked back through the front doors and into the parking lot, excited to get to work on a new story. The sun was shining down brightly on Clarkson Public School, as Schneider greeted a pack of students that had pulled up in a Patriots van at the same time. One by one, they piled out, all smiling, laughing and ready for school. “Some kids’ days may not start out the greatest, but as their teacher, you can be the influence that brightens their day,” Murren said. Just a couple of hours at Clarkson had brightened mine.